Racial Justice: Why Should Christians Care? The issues of race and the Church have historically converged into one of the most fundamental and egregious errors in evangelical history. Uh oh! Bold statement. For Sunday morning to STILL be the most segregated hour is a travesty. How is it that the IRS and P&G are more integrated than God's house is? Though we can legislate behavior and actions, issue of the heart are beyond the reach of governmental or corporate regulation. This is why we need the Church. But continuing to ignore issues of race and racism hurts our witness to the world and obscures the cross. What's that? You say it is just a matter of comfort? That you just prefer your own worship style? It isn't really such a big deal and certainly not a matter of racism? It's a convicting statement. Consider a standard suburban white Christian. Does she harbour beliefs that the problems of an inner city neighborhood would be solved if "those kids would just stay in school" and their moms "would just look for a job instead of living off welfare"? Maybe, maybe not. But the image of an allied seeker of multicultural fellowship does not jump to my mind. In fact, the church has a depressing history of a sluggish and neophobic nature. For some convicting research studies and statistics try Divided by Faith. No punches pulled there. Perhaps it is time for the majority to become a little more uncomfortable. It's a reflection of white folks' privileged to be able to avoid situations in which we are the only ones in a house of worship of our own race. And after a moment when we do experience the awkward self-awareness that such an experience can bring, we can easily and quickly retreat to an all-white world without enduring much sacrifice. How can we be so timid to experience an isolation to which many of our sisters and brothers in Christ have had to grow accustomed on a daily basis in the workplace, in schools, and in the church! Because we have these privileges, I believe it is the white folks’ responsibility to intentionally act to ease the burdens of racism by actively educating ourselves and working for change, particularly in the church where our claim is Holy love. It is for a similar reasons that I feel it is important for me, a white person, to be talking about race. White people don't tend to talk about race at all--positively or negatively. We have been trained by too many hushed words and too many winks and nods that it is a taboo topic. You are apt to say something stupid and get yelled at or....well...that's pretty much the only outcome, so we think. But silence breads ignorance. 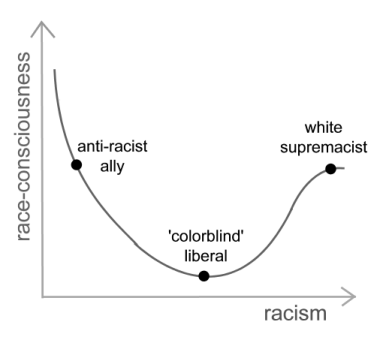 Conversely, many POC have heard too many stupid comments from white people about race. They shouldn't have to bare the constant responsibility of educating ignorant people like me. But what a predicament for an white person to find herself in! We need educated and redeemed white people to step up and take on some of the burden. Those of us that have been blessed with patient POC sisters and brothers must share what we know. What is more, having experienced the privileged majority status, we recognize and remember the allure of flawed logic and misinformation. Therefore, we can offer an understanding ear when a white sister says "Oh, I just don't see race. I'm colorblind" and then proudly declare the beauty of the colors that God has allowed us to experience, renouncing our colorblindness, helping her to do the same. We can hear the venomous words of prejudice and know that we can educate, perhaps preventing those words from ever reaching others' ears.